Prepare your vegetables: thinly slice or shred cabbage, peel and slice onion, cut carrots into thin strips or grate. Toast your nuts: heat a pan to medium, then add assorted seeds and nuts and dry toast until golden brown, stirring regularly. Remove from pan and set aside to cool down. Prepare noodles according to package instructions. I cooked mine in salted water for about 3-4 minutes, then drained and set aside to cool. Prepare your chicken (or tofu) - cut chicken breast into strips, season with salt, pepper, red paprika and garlic powder. Heat a large skillet or wok, add about 1 tbs vegetable oil and toss in the hot pan, stir-fry until cooked through. Remove from pan and set aside. Using the same pan, add another tbs of oil if needed, and then add sliced onions and carrots to the pan. Stir fry for a couple of minutes, until fork-tender, scrapping the bottom as you cook to loosen the browned bits up. 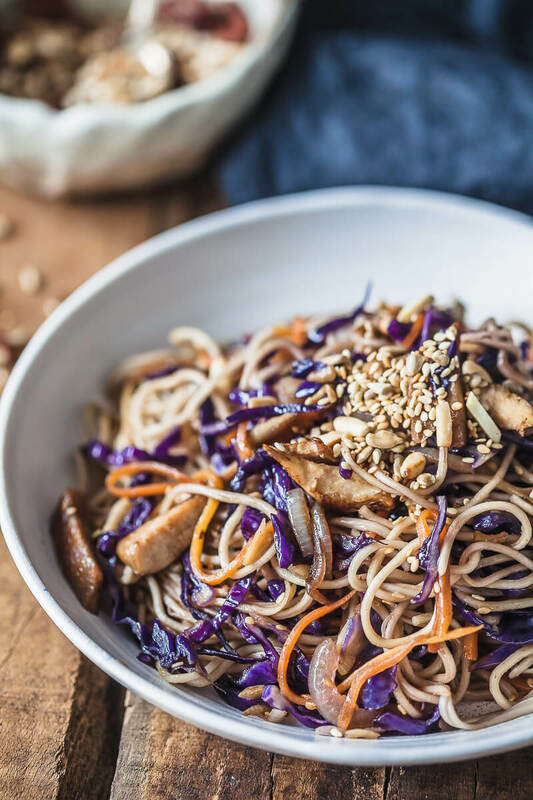 Add the cooked noodles, shredded purple cabbage, cooked chicken and a drizzle of soy sauce, then toss around in the pan to combine. Add more sauce if needed and give it a taste. Season with salt and pepper to taste. Serve topped with a sprinkle of toasted nuts.